Exempt from VED and pollution zone charges, 1073kg payload, easy to drive, eight-year battery warranty. Limited range of 93 miles, no fast charge option, not due until mid-2019. 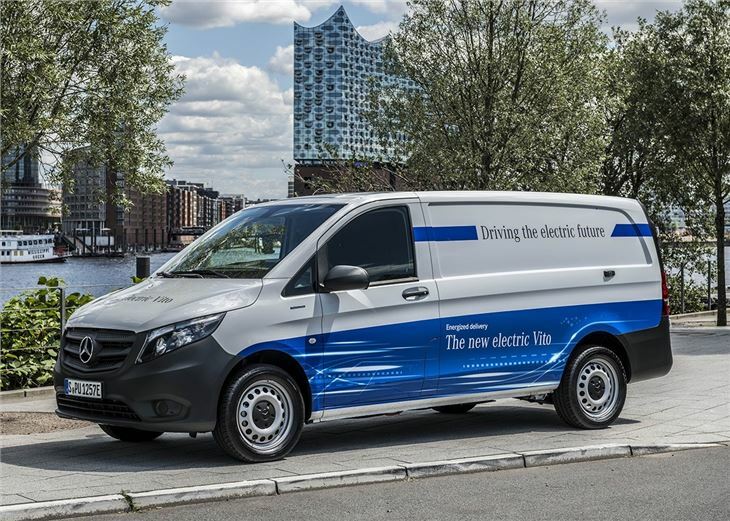 The eVito is the electric van that kicks off the new range of plug-in commercial vehicles from Mercedes-Benz. Designed for delivery drivers and city-based van operators, the eVito covers 93 miles on a single charge and can carry payloads weighing up to 1073kg - significantly more than the Kangoo Z.E, e-NV200 or Partner Electric. 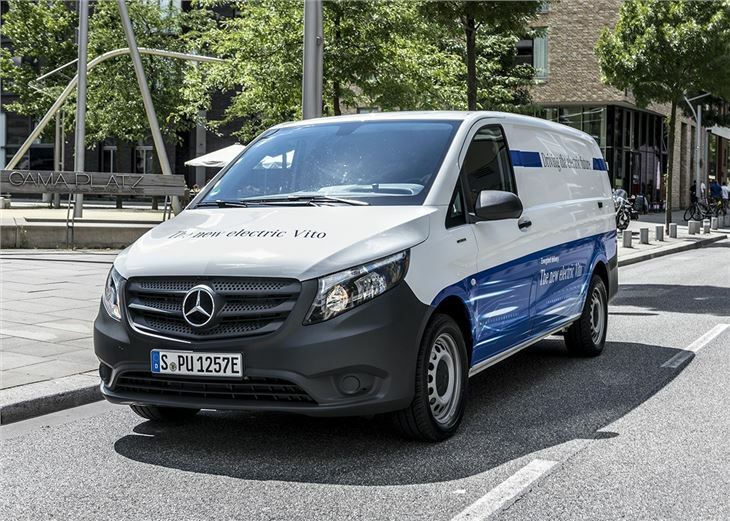 Mercedes-Benz is open about the fact that the eVito will not suit everyone; however, if you're a city-based courier who does short distance, multi drop deliveries it will make a lot of sense. Even more so when you consider the expensive DPF problems that cause headaches for diesel drivers. 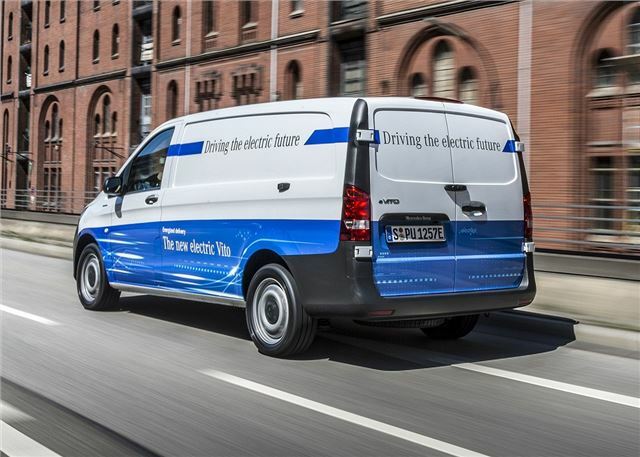 The all-electric van takes six hours to fully charge and the 84kW battery pack is stored under the loadspace floor so it doesn't impact load capacity. However, unlike some electric cars, you cannot hook the van up to a rapid charging point to boost the battery to 80 per cent in 40 or 50 minutes. And that means you have to carefully plan your routes and charging points. The eVito is available in two load lengths - long and extra long - and cargo volumes range from 6.0 to 6.6 cubic metres. Payloads are similar for both versions, with the long version carrying 1043kg and the extra long van taking 1073kg. All get twin side sliding doors as standard and gross vehicle weights (GVW) peak at 3.2 tonnes. 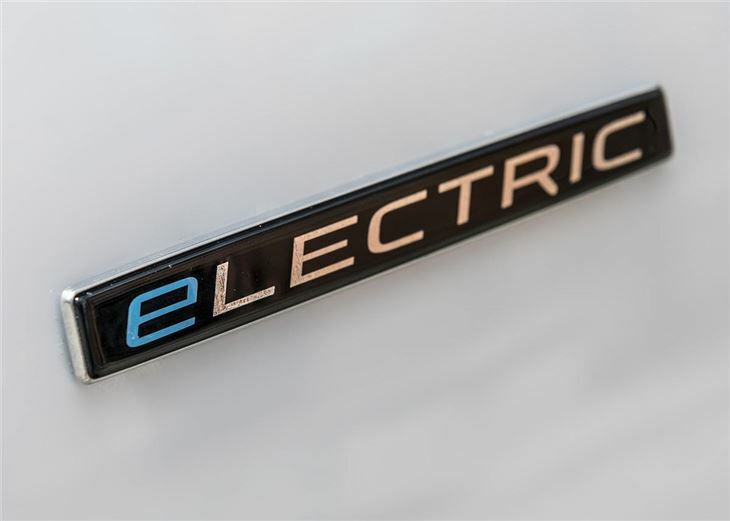 The electric running gear has - for the most part - been lifted from the Mercedes-Benz plug-in car range and this means the motor is silent and smooth. A regenerative braking system is fitted as standard and once you get into the habit of the vehicle automatically breaking when you lift the throttle, it's easy to add some additional miles of charge to the battery. Over a day of driving, the eVito will regain as much as 15 miles. On the road the eVito feels similar to the 111 CDI diesel with smooth steering and a comfortable, well-judged ride that doesn’t get overly bouncy when the van is unladen. The 84kW motor delivers 112PS to the front-wheels. And with 300Nm of torque available, the eVito easily whistles its way onto fast moving road; however, the van struggles for performance once you pass 50mph. The cabin has three seats as standard and an eight seat Tourer is also available. All vans get cruise control, multi function steering wheel and crosswind assist to prevent the van from drifting out of its lane in strong winds. Reach and rake adjustable steering costs extra, along with things like alloy wheels, body coloured bumpers and anti-theft alarm. Despite its limited range and sparse equipment levels, the eVito will fill a niche for delivery drivers who need a medium van for short runs in towns and cities. Its 2p-per-mile running costs (depending on your electricity tariff) and exemptions from VED and urban pollution charges also give it plenty appeal for van drivers who cover low urban mileages.